Type 1 diabetes can occur at any age. It is most often diagnosed in children, adolescents, or young adults. 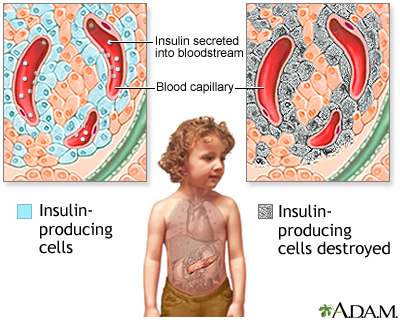 Insulin is a hormone produced in the pancreas by special cells, called beta cells. The pancreas is below and behind the stomach. Insulin is needed to move blood sugar (glucose) into cells. Inside the cells, glucose is stored and later used for energy. With type 1 diabetes, beta cells produce little or no insulin. Without enough insulin, glucose builds up in the bloodstream instead of going into the cells. This buildup of glucose in the blood is called hyperglycemia. The body is unable to use the glucose for energy. This leads to the symptoms of type 1 diabetes. The exact cause of type 1 diabetes is unknown. Most likely, it is an autoimmune disorder. This is a condition that occurs when the immune system mistakenly attacks and destroys healthy body tissue. With type 1 diabetes, an infection or another trigger causes the body to mistakenly attack the cells in the pancreas that make insulin. The tendency to develop autoimmune diseases, including type 1 diabetes, can be inherited from your parents. The following symptoms may be the first signs of type 1 diabetes. Or, they may occur when blood sugar is high. After many years, diabetes can lead to serious health problems, and as a result, many other symptoms. Fasting blood glucose level -- Diabetes is diagnosed if it is higher than 126 mg/dL (7 mmol/L) two different times. Oral glucose tolerance test -- Diabetes is diagnosed if the glucose level is higher than 200 mg/dL (11.1 mmol/L) 2 hours after you drink a special sugar drink. Hemoglobin A1c (A1C) test -- Diabetes is diagnosed if the result of the test is 6.5% or higher. A ketone urine test measures the amount of ketones in the urine. A ketone blood test measures the amount of ketones in the blood. Check the skin and bones on your feet and legs. Check if your feet are getting numb (diabetic nerve disease). Have your blood pressure checked at least once a year. The goal should be 140/90 mmHg or lower. Have an A1C test done every 6 months if your diabetes is well controlled. Have the test done every 3 months if your diabetes is not well controlled. Have your cholesterol and triglyceride levels checked once a year. Get tests once a year to make sure your kidneys are working well. These tests include checking levels of microalbuminuria and serum creatinine. Visit your eye doctor at least once a year, or more often if you have signs of diabetic eye disease. See the dentist every 6 months for a thorough dental cleaning and exam. Make sure your dentist and hygienist know that you have diabetes. Because type 1 diabetes can start quickly and the symptoms can be severe, people who have just been diagnosed may need to stay in the hospital. If you have just been diagnosed with type 1 diabetes, you may need to have a checkup each week until you have good control over your blood sugar. Your doctor will review the results of your home blood sugar monitoring and urine testing. Your doctor will also look at your diary of meals, snacks, and insulin injections. It may take a few weeks to match the insulin doses to your meal and activity schedules. As your diabetes becomes more stable, you will have fewer follow-up visits. Visiting your doctor is very important so you can monitor any long-term problems from diabetes. Your doctor will likely ask you to meet with a dietitian, clinical pharmacist, and diabetes nurse educator. These providers will also help you manage your diabetes. Insulin lowers blood sugar by allowing it to leave the bloodstream and enter cells. Everyone with type 1 diabetes must take insulin every day. Most commonly, insulin is injected under the skin using a syringe, insulin pen, or insulin pump. Another form of insulin is the inhaled type. Insulin cannot be taken by mouth because the acid in the stomach destroys insulin. Insulin types differ in how fast they start to work and how long they last. Your doctor will choose the best type of insulin for you and will tell you at what time of day to use it. Some types of insulin may be mixed together in an injection to get the best blood glucose control. Other types of insulin should never be mixed. Most people with type 1 diabetes need to take two kinds of insulin. Basal insulin is long-lasting and controls how much sugar your own body makes when you are not eating. Meal-time (nutritional) insulin is rapid acting and is taken with every meal. It lasts only long enough to help move the sugar absorbed from a meal into muscle and fat cells for storage. Your doctor or diabetes educator will teach you how to give insulin injections. At first, a child's injections may be given by a parent or another adult. By age 14, most children can give themselves their own injections. Inhaled insulin comes as a powder that is breathed in (inhaled). It is rapid acting and used just before each meal. Your doctor can tell you if this type of insulin is right for you. By testing your blood sugar level, you can learn which foods and activities raise or lower your blood sugar level the most. This helps you adjust your insulin doses to specific meals or activities to prevent blood sugar from becoming too high or too low. The American Diabetes Association and the Academy of Nutrition and Dietetics have information for planning healthy, balanced meals. It also helps to talk to a registered dietitian or nutrition counselor. Regular exercise helps control the amount of sugar in the blood. It also helps burn extra calories and fat to reach and maintain a healthy weight. Exercise is an important part of managing your diabetes. If you are obese or overweight, exercise can help you manage your weight. Talk to your doctor before starting any exercise program. People with type 1 diabetes must take special steps before, during, and after physical activity or exercise. Checking your blood sugar level yourself and writing down the results tells you how well you are managing your diabetes. Talk to your doctor and diabetes educator about how often to check. To check your blood sugar level, you use a device called a glucose meter. Usually, you prick your finger with a small needle, called a lancet, to get a tiny drop of blood. You place the blood on a test strip and put the strip into the meter. The meter gives you a reading that tells you the level of your blood sugar. Continuous glucose monitors measure your blood sugar level from fluid under your skin. These monitors are used mostly by people who are on insulin pumps to control their diabetes. Some monitors do not require a finger prick. Keep a record of your blood sugar for yourself and your health care team. These numbers will help if you have problems managing your diabetes. You and your doctor should set a target goal for your blood sugar level at different times during the day. You should also plan what to do when your blood sugar is too low or high. Talk to your doctor about your target for the A1C test. This lab test shows your average blood sugar level over the past 3 months. It shows how well you are controlling your diabetes. For most people with type 1 diabetes, the A1C target should be 7.5% or lower. Low blood sugar is called hypoglycemia. A blood sugar level below 70 mg/dL (3.9 mmol/L) is too low and can harm you. A blood sugar level below 54 mg/dL (3.0 mmol/L) is cause for immediate action. Keeping good control of your blood sugar can help prevent low blood sugar. Talk to your doctor if you're not sure about the causes and symptoms of low blood sugar. People with diabetes are more likely than those without diabetes to have foot problems. Diabetes damages the nerves. This can make your feet less able to feel pressure, pain, heat, or cold. You may not notice a foot injury until you have severe damage to the skin and tissue below, or you get a severe infection. Diabetes can also damage blood vessels. Small sores or breaks in the skin may become deeper skin sores (ulcers). The affected limb may need to be amputated if these skin ulcers do not heal, or become larger, deeper, or infected. Stop smoking, if you smoke. Get a foot exam at least twice a year from your doctor, and learn whether you have nerve damage. Ask your doctor to check your feet for problems such as a bunion or hammertoe. These need to be treated to prevent skin breakdown and ulcers. Treat minor infections, such as athlete's foot, right away. Good nail care is important. If your nails are very thick and hard, you should have your nails trimmed by a podiatrist or other provider who knows you have diabetes. Use moisturizing lotion on dry skin. Make sure you wear the right kind of shoes. Ask your doctor what kind is right for you. With type 1 diabetes, you are also at risk of developing conditions such as hearing loss, gum disease, bone disease, or yeast infections (in women). Keeping your blood sugar under good control can help prevent these conditions. Talk with your health care team about other things you can do to lower your chances of developing diabetes complications. Living with diabetes can be stressful. You may feel overwhelmed by everything you need to do to manage your diabetes. But taking care of your emotional health is just as important as your physical health. Feeling sad or down (depressed) or anxious sometimes is normal. But if you have these feelings often and they're getting in the way of managing your diabetes, talk with your health care team. They can find ways to help you feel better. There are many diabetes resources that can help you understand more about type 1 diabetes. You can also learn ways to manage your condition so that you can live well with diabetes. Tight control of blood glucose can prevent or delay diabetes complications. But these problems can occur, even in people with good diabetes control. You could have eye problems, including trouble seeing (especially at night) and sensitivity to light. You could become blind. Your feet and skin could develop sores and infections. If you have these sores for too long, your foot or leg may need to be amputated. Infection can also cause pain, swelling, and itching. Diabetes may make it harder to control your blood pressure and cholesterol. This can lead to heart attack, stroke, and other problems. It can become harder for blood to flow to the legs and feet. Diabetes can weaken your immune system and make it more likely for you to come down with infections. Nerves in the body can become damaged, causing pain, itching, tingling, and numbness. Because of nerve damage, you could have problems digesting the food you eat. You could feel weakness or have trouble going to the bathroom. Nerve damage can also make it harder for men to have an erection. High blood sugar and other problems can lead to kidney damage. The kidneys may not work as well as they used to. They may even stop working, so that you would need dialysis or a kidney transplant. Call your doctor or go to the emergency room if you have symptoms of diabetic ketoacidosis. You can treat early signs of hypoglycemia at home by drinking orange juice, eating sugar or candy, or by taking glucose tablets. If signs of hypoglycemia continue or your blood glucose level stays below 60 mg/dL (3.3 mmol/L), go to the emergency room. Type 1 diabetes cannot be prevented. There is no screening test for type 1 diabetes in people who have no symptoms. American Diabetes Association. 2. Classification and diagnosis of diabetes: standards of medical care in diabetes - 2018. Diabetes Care. 2018;41(Suppl 1):S13-S27. PMID: 29222373 www.ncbi.nlm.nih.gov/pubmed/29222373. Atkinson MA. Type 1 diabetes mellitus. In: Melmed S, Polonsky KS, Larsen PR, Kronenberg HM, eds. Williams Textbook of Endocrinology. 13th ed. Philadelphia, PA: Elsevier; 2016:chap 32. Cagliero E. Diabetes and long-term complications. In: Jameson JL, De Groot LJ, de Kretser DM, et al, eds. Endocrinology: Adult and Pediatric. 7th ed. Philadelphia, PA: Elsevier Saunders; 2016:chap 51. The catheter at the end of the insulin pump is inserted through a needle into the abdominal fat of a person with diabetes. 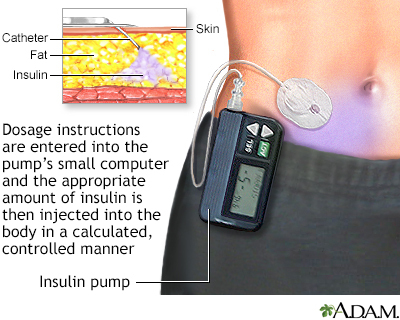 Dosage instructions are entered into the pump's small computer and the appropriate amount of insulin is then injected into the body in a calculated, controlled manner. Various styles of insulin pumps may be utilized by people with diabetes to inject insulin into the body in a controlled, more convenient and discreet manner. Checking your blood sugar levels often and recording the results will tell you how well you are managing your diabetes so you can stay as healthy as possible. The best times to check your blood sugar are before meals and at bedtime. Your blood sugar meter may have software to help you track your blood sugar level. This is usually available from the manufacturer's website.